In the two decades following World War II, it seemed there was no limit to technological growth. Sure, a computer was still the size of an entire room, and no one had telephones in their pockets. But techno-utopian ideas like flying cars and jetpacks and meal pills were all being taken very seriously as the inevitable fruits of science's labor. Despite the fact that we're still waiting on so many technologies from that Golden Age of Techno-Promises, there's one seed from this era that is indeed bearing fruit here in the 21st century: speech recognition technology. You can find it in places like Siri, countless automated phone programs used by banks and airlines, and even in surprisingly usable home consumer applications like Dragon Dictate, which just a decade earlier would have been frustratingly clunky. Speech recognition technology is here, and we're simply working out the kinks. But it's been a long time coming. 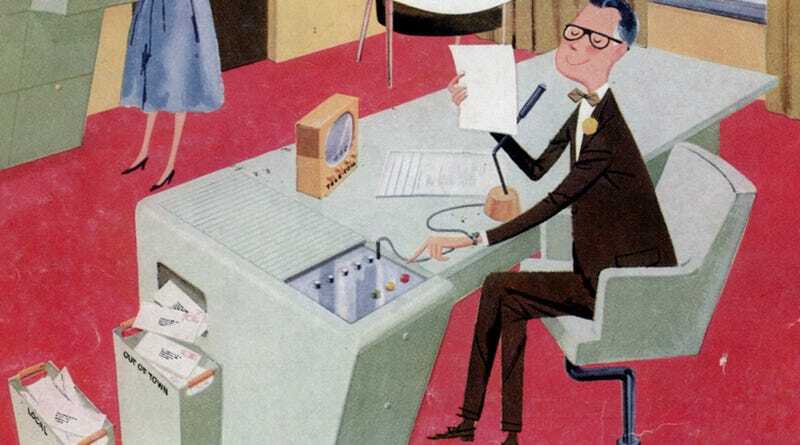 Allowing humans to be understood by machines through simple plain-speaking voice commands has been a dream of the retrofuture since at least the 1930s. By midcentury, some people imagined that even the supermarket checkout would be using speech recognition technology. But the primary civilian use case then, as now, was as your own personal assistant. This ad for New Departure ball bearings appeared in the January 1956 issue of Scientific American, and showed off what speech recognition tech might enable in the office of tomorrow. In the ad we see a businessman of the future dictating letters with ease. Think of dashing through your correspondence with this imaginary scribe! It converts your voice into electronic impulses which type, micro-record, fold, insert, seal, address and stamp letters almost as fast as you can dictate! It's just a notion now! But when some foresighted engineer works it out, you can bet New Departure will be called in to design the right ball bearings to keep these intricate parts working smoothly. New Departure works with engineers right from the planning stage to develop the exact bearing for even the newest departure in design. While ball bearings didn't have much impact on the progress speech recognition technology has made since the 1950s, the U.S. military did. Just as things like driverless cars, miniaturized GPS devices and the internet itself found their practical origins within the Defense Advanced Research Projects Agency (DARPA), so too did a machine's ability to understand your voice. But it wasn't until the early 1980s that DARPA put out a request for private developers to help accelerate the future of speech recognition into being—as is their mission for the military. And just as so many other DARPA experiments found practical use in civilian life (again, think about the internet itself) so too did DARPA help fund the experimental grandfathers of products like Dragon Dictation that we take for granted today. Remember that the next time you ask Siri if it's raining—you might want to specify clouds instead of cover fire.